When Karimah Lynum decided to begin her MBA program at Drexel, it was a rare occasion when a planner took a risk. With an urge to leave her hometown of Tampa, Fla., and the goal of becoming a research pharmacist, Lynum took several calculated chances on the path to getting her degree. A pharmacist by trade, Lynum saw getting her MBA as a natural way to progress her career. Lynum tested out a dual pursuit and attempted her MBA in the last year of her pharmacy studies at Florida Agricultural and Mechanical University (FAMU). But after realizing that joining the program meant non-stop schooling and an extended stay in Tallahassee, Lynum decided to focus on graduating with her pharmacy degree and moved to Philadelphia not long after graduation. With her 10-year anniversary as a resident coming up this year, Lynum says her love of the city grew over time, citing the pace of the city and a previous residency in the area as her reasons for the move. But with so many schools in the area, Lynum didn’t take the decision to go back to school as lightly as she had her move. She looked at several major schools in the area including Villanova, Temple, and Drexel, “You want a program that fits with you, but you also want to be able to say you went to a prestigious university,” says Lynum. For the wife and mother with a career on the rise, Drexel was the perfect fit for her life and schedule. “It’s tailored to my life – raising my daughter, going to work every day, and it’s a great program,” she says. 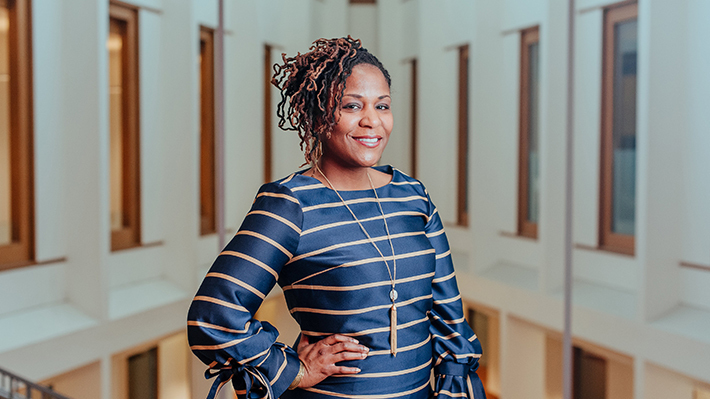 Currently working at Janssen Scientific Affairs, LLC as an associate director and clinical project scientist in neuroscience medical affairs, Lynum is on track to finish her MBA soon. She continues to teach at Philadelphia VA Medical Center, in addition to working on publishing a novel.